The northern part of the country is characterized by large deserts. Arica is the northmost city in Chile. The old city is full of buildings constructed during the colonial period, and Plaza de Armas Square is the location of the most famous sight of Arica – St. Marcus Cathedral. There is also an old Spanish fortress built in the middle of the 19th century in the city. Nowadays, the fortress is used to hold the exhibition of the Museum of History and Arms. Nearby mountains hide another landmark of the region – Fort Alacran that is built on the rock. There are also unusual cultural places of interest in the city, for example, the Museum of Mummies. Some exhibits of the museum are several thousand years old. Shopping in Chile - best shopping places, what to buy? 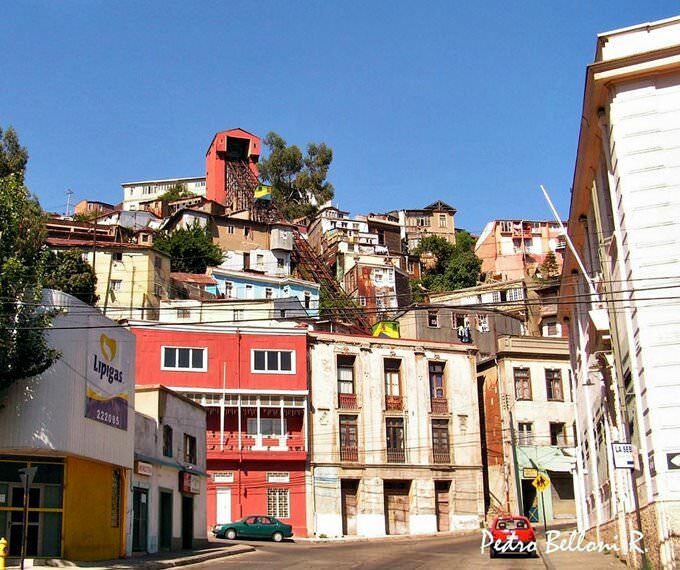 The city of La Serena is a popular tourist destination that never ceases to amaze guests. Tololo Observatory has become the symbol of the city. This is the largest observatory in the Southern Hemisphere. 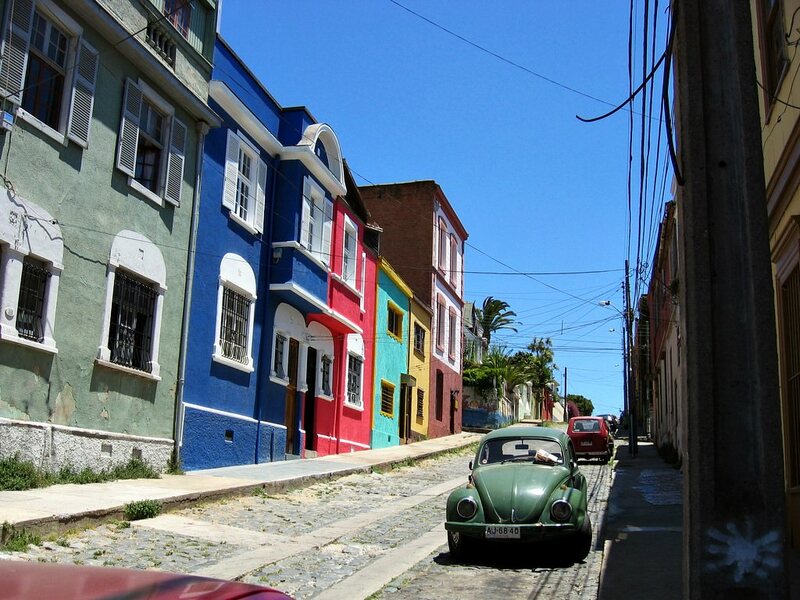 Besides that, there are several old wineries, gold mines and beautiful churches in La Serena. Visitors are usually charmed with St. Francisco Church that was built in 1844. Many places of interest and historic landmarks have survived in San Pedro de Atacama. Most of the landmarks belong to the Incan civilization and chinchorro tribe. Naturally, the capital of the country, Santiago de Chile, is home to many places of interest. The best way to explore the capital is to start from Plaza de Armas. The square is surrounded by many beautiful buildings – the Municipality building, Governor House, the Royal Audiencia, the cathedral, Fernandez Concha Portal, the old Post office and La Moneda Palace. Vina del Mar is a popular resort in Chile. Because of lush greenery, the city is often called “the garden city”. Travellers will find here beautiful beaches, spacious parkways, banana tree groves and botanic gardens. There are also several museums in Vina del Mar, namely the Museum of Fine Arts, museums of history and culture. The first settlements were formed on the territory of Chili over 13 000 years ago. Despite this, little is known of the early history of the country. At the turn of the 13th - 14th centuries, these lands were conquered by the Incas. At that time, their major aborigines were Aymara and Kichwa people. In 1535, there was a period of the Spanish colonization. When Spanish conquerors came to the coast, several new towns were formed. In the 16th century, the population of the natives declined almost by half because of diseases and wars brought by Europeans. Spanish colonizers hoped for finding large deposits of precious metals on the lands they had conquered but Chili lacked them. Europeans started using the lands they had inhabited for agricultural purposes. In the 18th century, several large deposits of copper were found in remote areas of Chili. The exploitation of them became an actual beginning of the industrial activity of the country. In 1810, Chili gained independence from Spain. Over the past hundred years, the young developing country had seen the rapid growth of industry. The country has started attracting the first tourists relatively recently. At present, Chili is well-known as a country with splendid winter and beach resorts, as well as unique nature and historical attractions. In the country, there are over ten upscale ski resorts that welcome guests at that time when popular European resorts are closed. In the surroundings of Santiago, there is a young ski resort called Valle Nevado that has already won the hearts of thousands of travelers. The resort is decorated in classical French style. It offers its guests a large area for skiing and other sports entertainments. In addition to skiing, there are also amazing beach resorts in Chili. On the Pacific coast, there is a charming old town La Serena that is famous for its colonial attractions and luxurious beaches. In the town, there are several old wineries that are very popular with tourists. 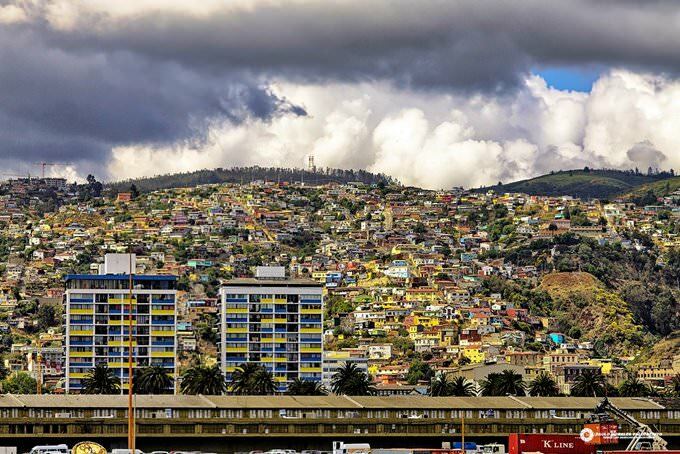 The historical resort of Vina del Mar was visited by the wealthiest travelers at the beginning of the 20th century. In the coastal zone, the richest people of the world built private mansions and villas. At present, this place attracts fans of beach recreation from all parts of the world. This article about iconic landmarks and sights of Chile is protected by the copyright law. You can re-use the content, but only under the condition of placement of an active link to www.orangesmile.com. You will find the largest and the most elite pool in the world in Chili, it is in Algarrobo resort city, in the San Alfonso del Mar hotels’ territory. This pool spreads over the coastline in 1000 meters; its land area is 8 hectares. 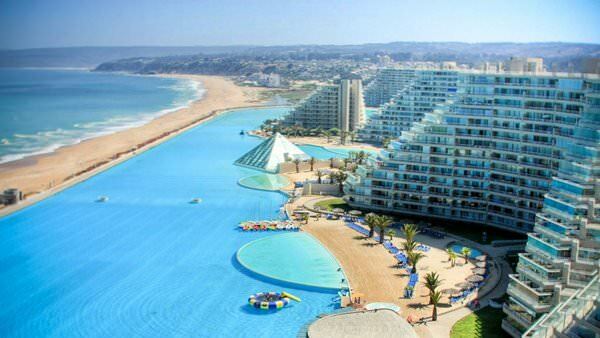 The largest pool in the world has the unique structure because water goes in it right from the ocean - that’s why it is salty. San Alfonso del Mar Pool is the Guinness Book of World Records’ champion. In addition, it has been the place for yachting competitions since its exploring. 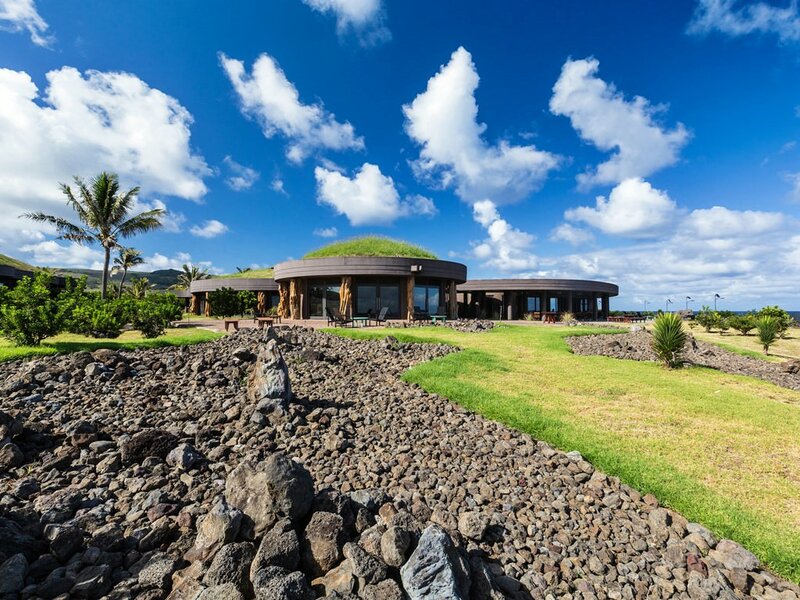 Rapa Nui National Park located on Easter Island is a world-famous landmark. 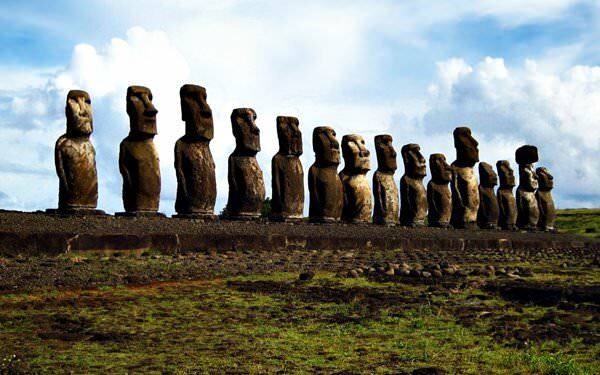 Numerous stone sculptures that are called moai were discovered there. The area of ​​the national park is about 7 000 square km. For thousands of years, these places have being the center of volcanic activity. 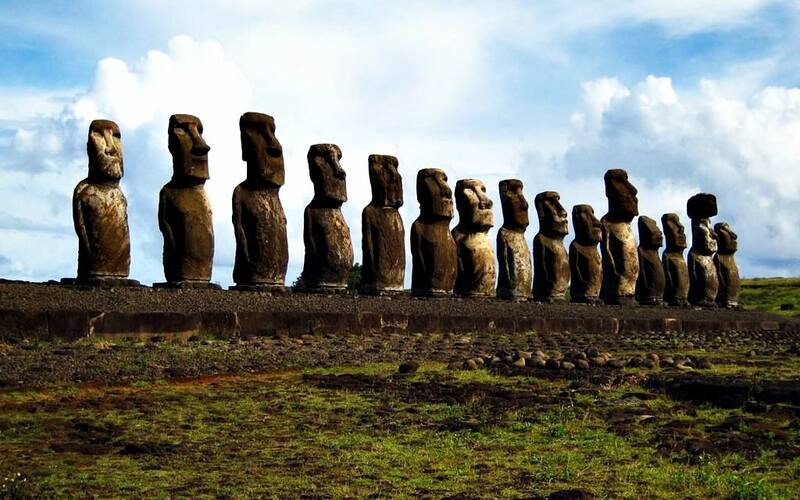 All the statues that were discovered on the island have been made of hardened volcanic rock. Those are nothing more than huge chunks of compressed volcanic ash. 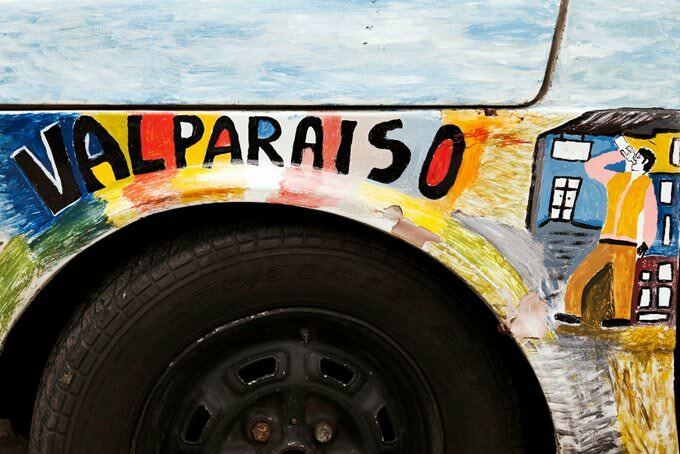 In Chile, the most extreme is the town of San Pedro de Atacama. It is situated right in the barren Atacama Desert. The place is considered one of the driest sites in the world. In average, there falls no more than 10 mm of rain per year. About 5 000 people are constantly living in this desert town. 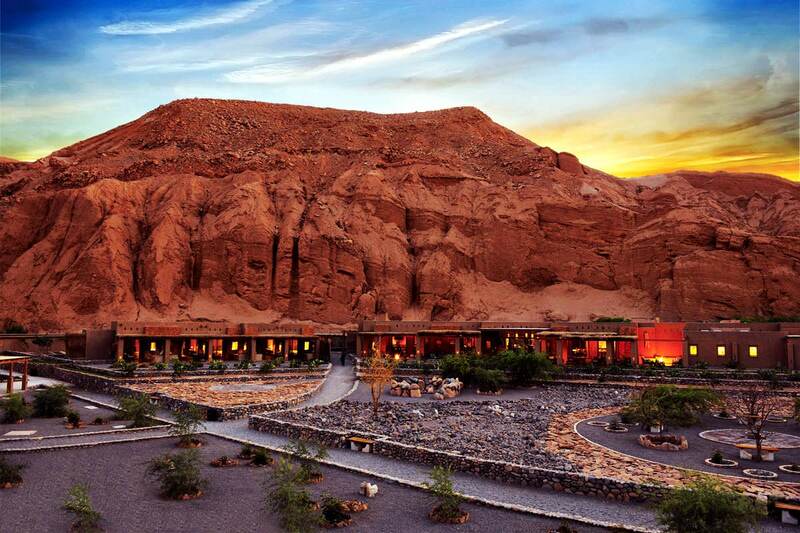 San Pedro de Atacama is one of the few extreme settlements in the world, which can be very amazing to tourists. Here, you can see a lot of unique attractions. One of the main symbols of the town is the white church of San Pedro built in the 17th century. While walking through the streets, you can see traditional whitewashed houses made of adobe stone. In the northern part of the town, you can see the ruins of older settlements, as well as remains of the fortress Pucara de Keator.